Harry Kurtjian, passed away peacefully on January 15 in Riverside, CA. Former husband of Rose (formerly Apelian). Beloved father of Carol (Garo) Artinian, Charlene (Erich) Kwek and Cassandra "Sandi" (Michael) Keossian. Cherished grandfather of 7 and great-grandfather of 13. Dear brother of Michael Kurtjian and the late Sue Kurtjian. 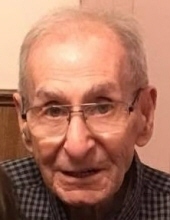 In state Tuesday 10:00 a.m. until his 11:00 a.m. Funeral Service at St. Sarkis Armenian Apostolic Church 19300 Ford Road, Dearborn. US Military Honors to follow the funeral at Church. Entombment at Michigan Memorial Cemetery. In lieu of flowers in Harry's memory are to St. Sarkis Armenian Apostolic Church or National Kidney Foundation. To send flowers or a remembrance gift to the family of Harry Haroutioun Kurtjian, please visit our Tribute Store. Dan Gark (Prayer Service) at 7:30 p.m.
"Email Address" would like to share the life celebration of Harry Haroutioun Kurtjian. Click on the "link" to go to share a favorite memory or leave a condolence message for the family.